Easy to assemble, self build exhibition counters, portable demonstration counters and desks for marketing and events. 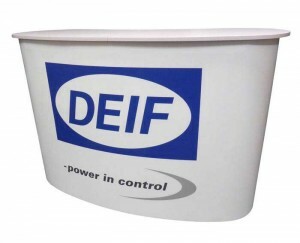 A great addition to your exhibition stand or marketing campaign. Storing your promotional items neatly in place these counters will more importantly draw attention to your stand from potential clients. All of our portable display counters are easy to build and pack away within either a carry bag or wheeled transit case for safe storage. In addition to our exhibition counters we also print replacement graphic wraps for most exhibition counters, stands and displays. Our most popular exhibition counter, especially popular with exhibitors, schools and universities. 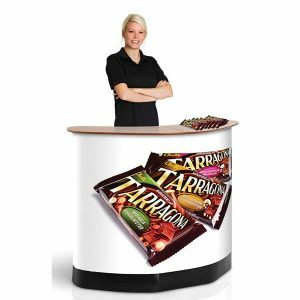 The standard pop up counter is a strong portable display counter which has internal shelving and a folding, wooden counter top (available in birch, black or white). It is supplied within a wheeled carry bag. Although this counter has no internal storage it still creates an impressive meeting point and goes perfectly with the Centro 3 exhibition stand. 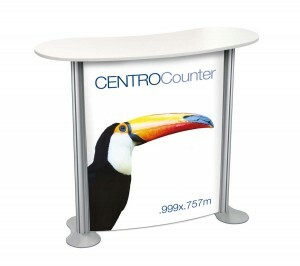 Centro Exhibition Counters are stylish looking, self build exhibition displays which have printed branding to face only. All hardware parts and printed graphic come within a wheeled hard case. The Expand ‘V’ Podium counter is a wheeled case which opens out to form a standard sized exhibition counter. Available with a choice of counter tops including Oak wood, Birch wood, Black, White and brushed Aluminium and has internal shelves and graphic wrap. ‘Promo’promotional counters are lightweight display counters, ideal for demonstration or marketing campaigns. Often used as sample give away stations or low cost exhibition counters, these low cost counters make eye catching displays when being used indoors or outside. Much larger exhibition desks created by joining two Expand ‘V’ cases together, complete with a printed graphic wrap, internal shelves and a vast choice of counter tops. 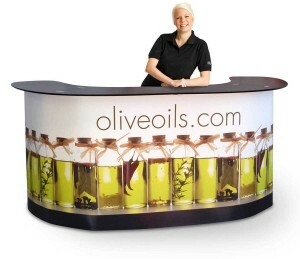 Mini Pop Up Counters are much smaller counters for events where space is limited. 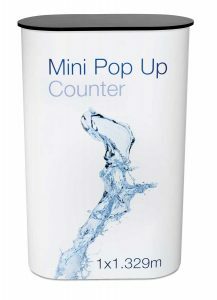 These mini pop up counters do have internal shelves and a printed graphic plus a small wooden counter top.